We recommend checking out our discussion threads on the Heliopan Bay 104 KR6 (81EF) Color Conversion Filter 710417, which address similar problems with connecting and setting up Light Balancing/Color Conversion Heliopan. The user manual for the Heliopan Bay 104 KR6 (81EF) Color Conversion Filter 710417 provides necessary instructions for the proper use of the product Photography - Filters - Light Balancing/Color Conversion. With double the strength of the KR3 (81A), the Bay 104 KR6 (81EF) Color Conversion Filter from Heliopan leads to neutral color rendition in strong haze or in the mountains above 2500m (8200'). Even though the human eye automatically adjusts to various lighting conditions, film does not. Irrespective of the light source, a white sheet of paper will always "appear" white to the human eye. However, when photographed under various lighting sources, the paper will reproduce a representation of the light it was shot under. A KR6 filter will allow you to correct for this white balancing problem when you wish to reduce the color temperature of the shot and bring your tones back to a more acceptable level. In addition, this filter is particularly effective when you wish to go in the other direction and make a warm image even warmer - such as a photograph on a beach where you wish to bring out the feeling of heat even more. Box Dimensions (LxWxH) 6.2 x 5.7 x 0.7"
The user manual for the Heliopan Bay 104 KR6 (81EF) Color Conversion Filter 710417 can be downloaded in .pdf format if it did not come with your new light balancing/color conversion, although the seller is required to supply one. It is also quite common that customers throw out the user manual with the box, or put the CD away somewhere and then can’t find it. 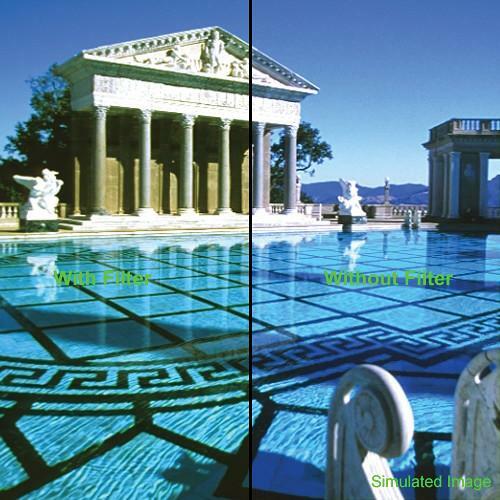 That’s why we and other Heliopan users keep a unique electronic library for Heliopan light balancing/color conversions, where you can use our link to download the user manual for the Heliopan Bay 104 KR6 (81EF) Color Conversion Filter 710417. The user manual lists all of the functions of the Heliopan Bay 104 KR6 (81EF) Color Conversion Filter 710417, all the basic and advanced features and tells you how to use the light balancing/color conversion. The manual also provides troubleshooting for common problems. Even greater detail is provided by the service manual, which is not typically shipped with the product, but which can often be downloaded from Heliopan service. If you want to help expand our database, you can upload a link to this website to download a user manual or service manual, ideally in .pdf format. These pages are created by you – users of the Heliopan Bay 104 KR6 (81EF) Color Conversion Filter 710417. User manuals are also available on the Heliopan website under Photography - Filters - Light Balancing/Color Conversion.